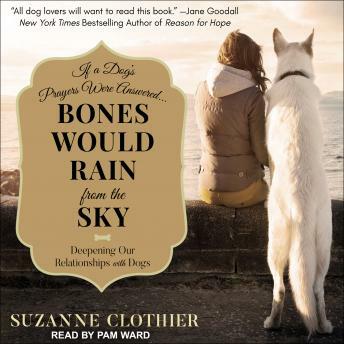 In Bones Would Rain from the Sky, Suzanne Clothier takes a radical new direction in understanding our life with dogs . . . and our mutual love. Drawing on a lifetime of experience with dogs, this nationally renowned dog trainer brings us astonishing new lessons about our animals-and ourselves. Gently, with intelligence, humor, and unfailing patience, Suzanne Clothier guides us to truly comprehend another creature's mind and heart. You will discover how our dogs see the world from their uniquely canine perspective, how we can meet their deep need for leadership without using force or coercion, and how the 'laws' of canine culture often put our dogs at odds with us and our very human world. Clothier's unparalleled insights into aggression in dogs can help prevent a tragedy, including the unnecessary destruction of a pet. As in no other 'dog book' or training manual, in Bones Would Rain from the Sky an extraordinary woman shows us how to find a deep connection with another being and to receive an incomparable gift: a profound, lifelong relationship with the dog you love.